Bill Law has spent the past 20 years as a radio journalist after stints in theatre and publishing in his native Canada. He began his radio career with the Canadian Broadcasting Corporation where he produced current affairs, arts and music. He joined the BBC as a freelance reporter in 1995, helping to launch BBC Radio Five Live. In 1997 he joined BBC News and Current Affairs and produced two Sony award-winning programmes, PaperTalk and Late Night Live. In 2001, he returned to documentary making for BBC Five Live Report, producing - amongst other stories - 73 Million to One, an expose of the wrongful murder conviction of Sally Clarke, the mother found guilty but subsequently exonerated in the death of her two infant sons. Over the past several years, he has found himself drawn increasingly to coverage of the Islamic world. Two weeks after the terror attacks of 9/11 he produced Inside a Jihadi Training Camp a groundbreaking and revealing programme that took listeners for the first time into a secret Kashmiri camp, and into the hearts and minds of Islamic militants. Subsequently he has produced and presented documentaries from the Palestinian occupied territories, from Iraq, Saudi Arabia, Pakistan and Bahrain. 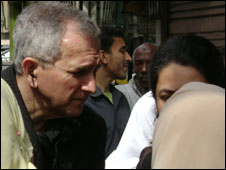 In November 2003 a programme for BBC Radio 4's Crossing Continents coincided with the bombing of a family compound in Riyadh, Saudi Arabia, on 8 November 2003. As the only BBC journalist in the Kingdom at the time of the blast he reported across virtually every BBC radio and television outlet as the story unfolded. Bill has also reported from both West and East Africa for BBC Radio 4 and Five Live. He will bend just about anybody's ear saying what an amazing opportunity it is for him to work for the BBC, a news gathering organisation he believes is the best in the world.